I don’t think I have ever had a banana bread that I didn’t like but this recipe, using Greek yogurt, was over-the-top moist like no other banana bread I have ever made. Growing up, we would get all excited when our dad would get out the mixing bowl and his recipe cards. He writes everything in neat, tiny writing on index cards – everything – but especially his recipes. We had tons of cookbooks in the house – Joy of Cooking, Betty Crocker, Boston Cooking School – but, really, when I decided to venture into the kitchen and try to cook by myself, I went straight for his recipe box. I changed up my dad’s tried and true Banana Bread recipe just a bit to make the Banana Bread with Greek Yogurt by swapping out some butter for – you guessed it! – Greek yogurt. The results were pretty stellar. Way moist! Anyone top their banana bread with cream cheese or is that just me??? This really easy recipe makes good use of Greek yogurt instead of butter! Delicious! Combine all dry ingredients in mixing bowl - including sugar. Add eggs and bananas. Blend well. If you like chocolate chips or nuts, add them last. Cook for an hour. Some ovens might cook faster – so check your bread after 50 minutes. A knife inserted into the center should come out clean. 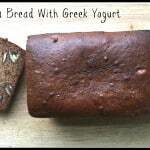 Banana bread is my favorite and with Greek Yogurt it is even better! No such thing as a bad banana bread!! Looking at your banana bread brought back so many memories of my mother-in-law’s banana bread. She always loaded her loaves with walnuts. I like the idea of adding extra nutrition by using Greek yogurt. Sounds like a great loaf of bread! Thanks, Kristen! It is amazing how different foods hold so many memories. Looks great, I would have never thought to use greek yogurt! Thanks! 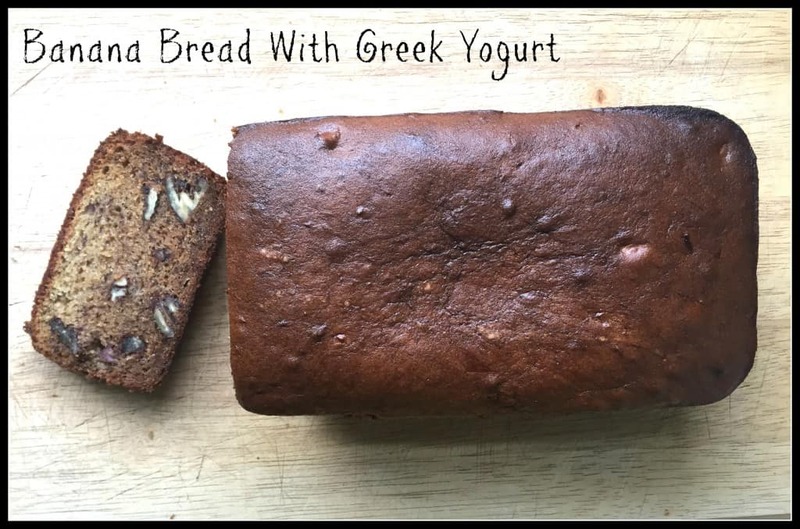 I have been using Greek yogurt more and more in baked goods and the results have usually been good!